The New Mexico Licensure system completed another successful session today, March 31st., with more than 1,500 educators participating in the Professional Development Dossier system. 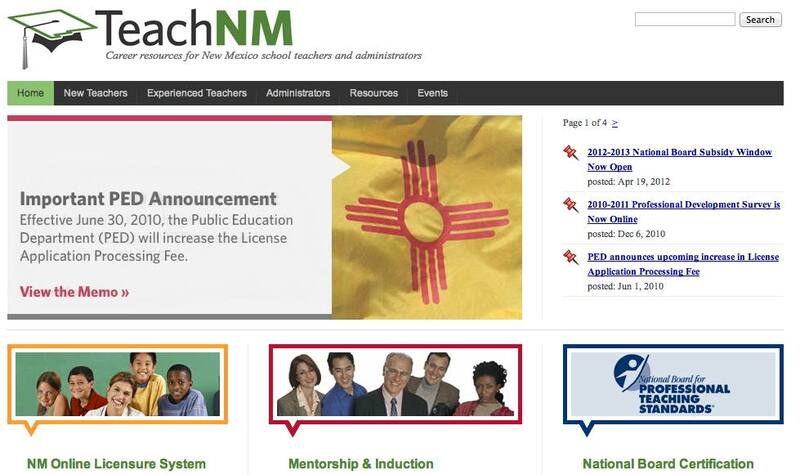 As teacher preparation and professional development becomes more and more necessary, the New Mexico Public Education Department, Division of Educator Quality, has designed an amazing online solution which integrates license management state-wide, merit-based reviews of teacher portfolios, professionally trained reviewers, and appropriate changes to licensure level and compensation. This system is serious business. School administrators need to approve the educator's submission, credentials are checked through the state licensure office, and a well trained team of portfolio reviewers analyzes the submissions from each teacher (supported by the University of New Mexico). In the end, failure can literally mean that a teacher is no longer able to practice in New Mexico. Evidence of high quality teaching can mean advances in licensure and increased compensation. Congratulations to the teachers, their administrators, and to the New Mexico Public Education Department, and the technical and help desk staff of VisionLink for another successful session, with more than 1,500 submissions from New Mexico educators. The Professional Development Dossier System is deployed as part of VisionLink's Community Operating System (CommunityOS). If you would like to learn more, follow this link: www.teachnm.org.